Save a fortune and buy pre-loved or sell and make money from your unneeded items. If you are looking to save money then you’ll find lots of bargains on baby, toddler and childrens items at our nearly new baby and toddler events. If you want to make some spare cash and sell your toys, clothes or equipment that your little ones no longer need then book a table at one of our busy events. It’s easy. You can create some room and make some extra cash for just a couple of hours work. Either way, we look forward to seeing you at an event soon! Find the event you want to sell at. Scroll to the bottom of the event page and you’ll find a button to link through to eventbrite where you can secure a table in seconds with a secure online payment. Then we send you all the details. It’s easy! 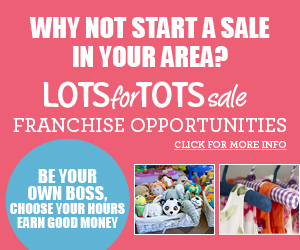 Want to start your own Lots for Tots Sale? If you would like to be your own boss, choose your own hours and earn a great income then why not start a sale in your area. For more information click here. What our customers say about our sales.